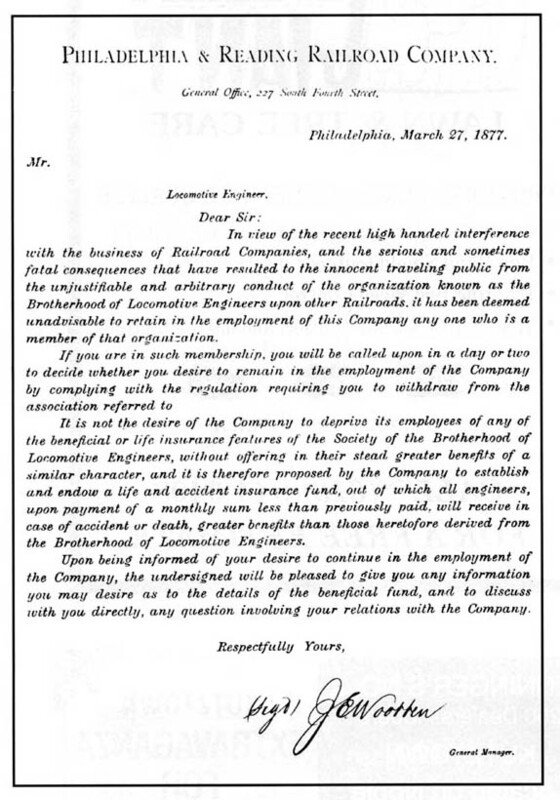 Below is letter (in circular form) which was sent to the Philadelphia & Reading Railroad engineers on March27, 1877. The intent was clear: to break the burgeoning union known as the Brotherhood of Locomotive Engineers. Nevertheless, it is now a historical reality that the tough stand by the railroad led eventually to the July rioting in the center city “Seventh Street Cut” leading to ten deaths. And the anti-union stand taken by tile P&R in March of 1877 was universal among all of the U.S. railroads.attitude about the locomotive engineers’ union began with the tough and self-assured P&R president, Franklin B. Gowen. It was not likely that Wootten disagreed materially with Gowen’s stand.